Right now, only the groups who can either buy or bully their way into the discussion are participating in peace talks for eastern Congo. In a policy brief released today, the Enough Project's Aaron Hall and I identify incentives and coercive economic and diplomatic tools that can be used to bring the necessary parties to the negotiation table in a mindset where they are willing to make the difficult decisions necessary to forge a lasting peace. The third in a three-part series on Congo's peace process, the report argues that the international community, with behind-the-scenes U.S. leadership, must apply a carefully calibrated package of leverage on relevant stakeholders. Most analysts agree that eastern Congo needs a broader, legitimate, and internationally-mediated peace process. However, the international community is still struggling to get the right actors together to achieve this objective. We argue that Rwanda, the M23 Movement, the Congolese government, and local eastern Congolese leaders all need to be involved in the peace process. Without endorsing any specific package of leverage, the brief identifies the carrots and sticks that can be used to bring those parties to the table. Economic and security interests animate Rwanda’s behind-the-scenes involvement in the current crisis in eastern Congo. The brief presents incentives that address both those concerns. We propose a joint economic framework for long-term investment in a responsible minerals trade, and an international commitment to help facilitate cross-border shared resources management through foreign direct investment in the Great Lakes region. 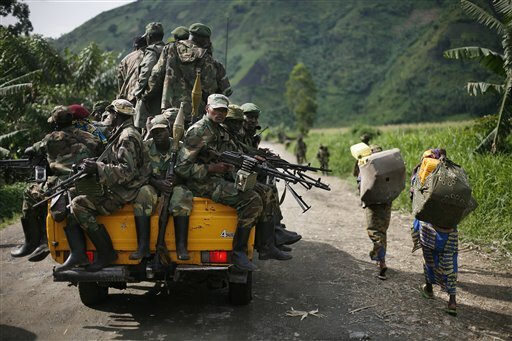 We also suggest that security assurances in the fight against the FDLR could be effective. The planned regional intervention brigade envisioned by the 11+1 framework could be a vehicle for this assurance. The policy brief also suggests discussion of land tenure, border control, and refugee return issues. Finally, we note that the potential for renewed international political capital garnered by constructive participation in the peace process should not be overlooked as a motivator for Rwandan leaders, particularly as they begin their two-year tenure on the U.N. Security Council. The credible threat of individual sanctions on Rwandan and Ugandan officials supporting the M23 movement remains the most potent leverage the United States has, and if evidence of support continues, the Obama administration should not hesitate to enact those sanctions. The brief also suggests that the international financial institutions could continue to withhold loans from the Rwandan government and that even the threat of targeted U.N. sanctions or an embargo on Rwandan minerals could have a chilling effect on smuggling. Since the M23 gains so much from merely being recognized as a participant in peace talks, the Enough Project’s new report focuses on coercive tools available against the rebel movement. We specifically note that the threat of both domestic and international prosecution as well as forced disarmament remain the strongest tools in the international community’s arsenal. For Kabila’s government, international assurances for respecting Congolese sovereignty remain incredibly valuable. Additionally, offers of foreign direct investment to promote regional economic integration, and security assurances on land, border, and refugee issues in the East might help build internal political capital for additional concessions. These constructive levers must be accompanied by coercive preconditions calling for reform of the Congolese natural resources management policies and its security sector. No durable peace can be secured without the support of local leadership in eastern Congo. Participation would provide a voice to historically marginalized segments of the eastern Congolese population and give them a chance to push for increased livelihood, economic, and infrastructural development in their respective communities. On the other hand, in the absence of a clear commitment to making peace, the international community might authorize forced disarmament, particularly against spoiler armed groups operating in the Kivus.